Verdant by Vancity Enterprises Ltd.
Verdant at Simon Fraser University (SFU) was built by VanCity Enterprises in 2007. The unique aspect of the Verdant town homes is the innovative pricing program. This unique affordability program ensured all Verdant town homes were sold at 20% below market value initially and continue to be sold at 20% below market value when the current owner chooses to sell. Each town home is appraised by an independent property appraiser and the list price is set at 20% below appraised value. Verdant is a two storey town home building built with environmental design and stylish living spaces which complement the modern exterior of these SFU homes. Verdant is efficient contemporary and affordable living. Verdant's large, two-storey town homes range from one thousand to thirteen hundred square feet each. 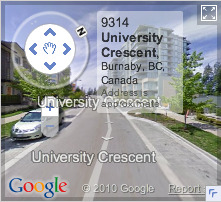 Verdant being adjacent to Simon Fraser University places it near transit to Vancouver,Burnaby, Coquitlam, Port Moody. You'll find it is walking distance to the numerous shops, services and restaurants of High Street Village Centre and the various indoor & outdoor recreation living at UniverCity offers. Verdant - 9191 University Cres.